First published in 1969. The book continues to be a storehouse of basic information about India’s leading personalities, who by their achievements and status have come to be acclaimed in their respective fields. It provides answers to four basic questions: Who? When? What? Where? This authoritative wealth of information is crucial as it provides information at your fingertips about the people who count. 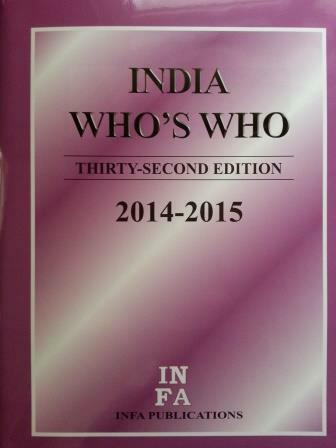 In its 30th year of publishing it contains the names of those persons who deserve to be included as there are no paid entries. It is revised regularly, providing new facts about existing entries and bringing carefully selected new entries. A library of information, the annual contains some 5,000 concise biographies of prominent people in all walks of life, including politics, civil service, business and finance, education, art, entertainment and sports, in fact every sphere of activity. For easy reference the entries have been arranged profession-wise for quick and selective reference. It is an outstanding reference book which improves from edition to edition. GANDHI, Sonia; (Cong); Cong Pres; b 9 Dec 46, at Orbassano Turin (Italy); d of Late Stefano Maino & Paola; m, Late Rajiv Gandhi; one s, one d; Ed: Diploma in English, Studied at Cambridge Univ. (UK); Chairperson: Cong (I) Parliamentary Party (CPP), Rajiv Gandhi Foundation, Indira Gandhi Memorial Trust, Jawaharlal Nehru Memorial Fund, Nehru Trust for Cambridge Univ; Kamala Nehru Memorial Soc & Hospital, Nehru Memorial Museum & Library, Ind Council for Child Welfare Trust; Swaraj Bhawan Trust; Patron, Round Square (Intl Group of Schools); UK; elected to Lok Sabha, 99 & 04 from Rae Bareily; Pub: Rajiv World, edited Freedom’s Daughter, Two Alone, Two Together; Add: 10 Janpath, New Delhi -110011; T: 2301 2686, 4161, 4481, Fax: 2301-8651.